Comet has the latest technology in air duct cleaning and disinfecting. Our new patented SaniJet system for disinfecting is by far the best in the industry and nothing else compares. 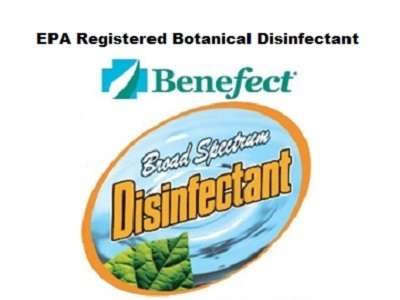 Benefect is a ‘plant immune system’ in a bottle. Using the SaniJet is much more work than the old fogger that you just aimed into a vent, The SaniJet goes deep into the system from every vent register. Comet began disinfecting air vents at $35/vent. I ran a special offer to disinfect heat and cooling vents at $15/vent, more than 50% off. This worked very well and we were able to disinfect many homes with our new system and at the same time, we got very good at it. Comet air duct cleaning was getting 5-star reviews and People would call me just to tell me how wonderful it was to breathe good clean air, most of these were people with severe allergies. Just the word of mouth brought Comet a lot of work so I decided to make it so we could do disinfect the air ducts in every home. The one thing that is overlooked every year when spring cleaning is the most disgusting, dirty thing in your house. [ Your heating and cooling air ducts.] What's in your air ducts would be shocking to you, every job we do is such a shock to our clients when they see with their own eyes what we are getting out of those vents. We will almost always find construction debris, [sawdust, sheetrock dust, paint overspray] Dead skin [ each of us shed around 8 pounds of skin/year, multiply that by the number of people living there, plus all the people who lived in your home before you and you can start getting the picture, right.] Dust mites [ they live on dead skin and are in the billions in your vents]. In some cases, we have found dead lizards, birds, and mice. Also half-eaten sandwiches, cans of sardines, and even dirty diapers. Take all this into consideration, unless you built your home, I would clean and disinfect my air duct system and the sooner the better. You can't imagine what you are breathing in your home. So the next time you see all that dust settling on your tables, furniture, countertops, Think about how much of that is actually coming from your heating and cooling system. Comet Air Duct Cleaning had earned a great reputation by doing a better job of cleaning air ducts. With our system, we do a job better, faster and this results in better prices. When it comes to disinfecting air vents, we can't be compared with anyone. Comet used our own PATENT PENDING Sanijet application system along with our 100% all natural Benefect disinfectant The World's Only Authentically Botanical Disinfectant. We started out with a charge of $35/vent for disinfecting, it's the same process as cleaning with an extra step. After a while, we ran a special offer for disinfecting heat vents for 50% off. This produced a lot of disinfecting Jobs for us and 2 things happened we didn't expect. 1- we got very good at it and that saved lots of time. 2-The other, and by far the most important for us here at Comet ADC was the amount of 5-star reviews we received, and phone calls. I knew we had the best product "Benefect" but for people who suffer from allergies, asthma, sinus, and respiratory issues, they were telling me amazing stories. Their homes turned into sanctuaries for them. We began to receive a large increase in jobs just from word of mouth.